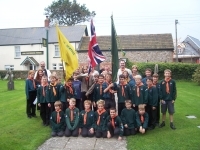 The cubs and scouts from 1st Hemyock (pictured) paraded the new Cub Scout flag to the morning service at St Mary's Church, where it was blessed by the Rev David Sherwood who conducted the service. Readings were given by Chris Pettigrew and Hollie Pinder with prayers read by a number of Cubs and Scouts. The Union flag was carried by Amie Sellick with brothers Josh and Oliver Jordan carrying the Scout and Cub flags respectively. The recent annual sale organised by the Scout Group and held at Hemyock parish hall once again attracted a long queue of buyers long before the event opened and raised £1,100. The organisers would like to thank all those who supported the sale and helped raise funds for the group.